Rethinking Evolution in the Museum explores the ways diverse natural history museum audiences imagine their evolutionary heritage. In particular, the book considers how the meanings constructed by audiences of museum exhibitions are a product of dynamic interplay between museum iconography and powerful images museum visitors bring with them to the museum. In doing so, the book illustrates how the preconceived images held by museum audiences about anthropology, Africa, and the museum itself strongly impact the human origins exhibition experience. Although museological theory has come increasingly to recognize that museum audiences `make meaning' in exhibitions, or make their own complex interpretations of museum exhibitions, few scholars have explicitly asked how. 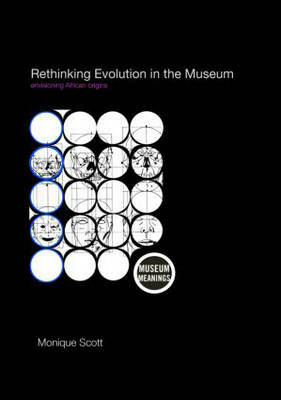 Rethinking Evolution in the Museum, however, provides a rare window into visitor perceptions at four world-class museums-the Natural History Museum and Horniman Museum in London, the National Museums of Kenya in Nairobi and the American Museum of Natural History in New York. Through rigorous and novel mixed methods (quantitative and qualitative) covering nearly 500 museum visitors, this innovative study shows that audiences of human origins exhibitions interpret evolution exhibitions through a profoundly complex convergence of personal, political, intellectual, emotional and cultural interpretive strategies. This book also reveals that natural history museum visitors often respond to museum exhibitions similarly because they use common cultural tools picked up from globalized popular media circulating outside of the museum. One tool of particular interest is the notion that human evolution has proceeded linearly from a bestial African prehistory to a civilized European present. Despite critical growths in anthropological science and museum displays, the outdated Victorian progress motif lingers persistently in popular media and the popular imagination. Rethinking Evolution in the Museum sheds light on our relationship with natural history museums and will be crucial to those people interested in understanding the connection between the visitor, the museum and media culture outside of the museum context.